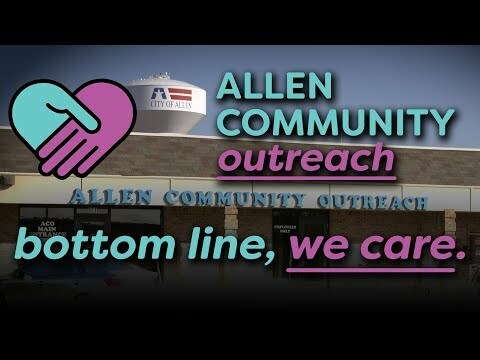 Allen Community Outreach helps transform lives by providing essential human and social services in our communities. Allen Community Outreach (ACO) has been serving its neighbors and friends facing financial crisis in Allen and the surrounding communities in Collin County, Texas since 1985. ACO provides free comprehensive human services to help families avoid hunger and homelessness and gain financial security. ACO offers Income Support Services, such as food, clothing, housing assistance, medical visits and prescriptions assistance; and Education and Employment Services including GED classes, college assistance, financial literacy, and career counseling. We are super thankful to a special group of donors who came together to build today's matching fund. We want to encourage current and new supporters to take advantage of this great opportunity, which will multiply donations to ACO on North Texas Giving Day!